Microsoft's Garage undertaking has already created a bunch of nice Android apps, and now it's time to conquer iOS, as part of Microsoft's new multipronged mobile strategy. 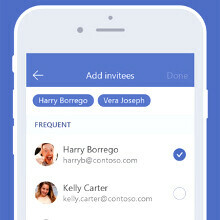 The new iOS entrant is called "Invite," hinting at the app's ability to schedule and organize meetings, something that office folks would appreciate, and that's Microsoft's stronghold right there. Invite works in a pretty simple way - you log in with your email account (it's suited for Office 365, but any email would work, too), and start shooting out timing suggestions to the potential attendees. Those will be received as Invite notification alerts, if they have the app installed, or as email if they don't. The participants then shoot back what times work for them individually, and in the end you set up a meet with the most suitable timing for all. The meet gets sent to the attendees, so that they can add it to their scheduling calendar, and that's all there is to it. Invite is currently available for iOS gear in the US and Canada, but you can bet it's coming to Android and Windows phones, too. Instead creating apps for iOS, they can create for Windows Mobile. Atleast they would have a strong reason to use Windows Mobile in Enterprise. They haven't been marketing Windows mobile to enterprises. MS has to work on their marketing if they want Windows mobiles to be a hit. This platform is capable enough to work well in an enterprise. I'm confused at the last sentence. Who are you referring to? Microsoft is heading toward more of services than hardware and they also planning to make Android and iOS apps ready to work on their Windows 10 mobile. So instead of making apps for their platform,they would make these apps for iOS and Android and then they will just easily work on their new platform. But I think that they should make their apps look like the metro styled apps (or at least have that option of UI).